I know what you're thinking: vacation from what, lady? You sit around your house in slippers all day and you get paid good money to perform assorted mayhem on the web. How exactly do you get more relaxed than that? Well, I intend to find out, so don't look for any postings on Monday or Tuesday, dear readers. Don't get me wrong: I do not take care of my children during the day whilst working. I'm not "working at home", I'm working, and as a general rule, my job description does not include parenting. Once my workday is done, naturally I'm on the mommy tip, making sandwiches and the like. But during the day, I am not here. Seriously. Don't ask. When school is out, the little kid still goes to preschool, but the big one really is big -- twelve. She's quite old enough to make sandwiches, go swimming, take a bike ride around our quiet neighborhood, and so on. But somehow just having her around all summer takes away just a little bit from my focus. Today I put my finger on it: having someone around the house who is really in the local timezone rather than in my otherworldy East Coast existence is really distracting at a psychic level. It hit me as I made pasta with pinenuts and romano cheese today at ten in the morning. Without a pre-teen lounging around sluggishly in her pajamas, it was easy to stay in my East Coast mindset. I know, it's a little deranged. But this is how it works for me. ...and I will say it again. Right now, in fact: I have got to learn how to slow down when doing conference calls. It is the hardest thing in the world, but it's really important, and here is why: When you are in a face-to-face meeting, the other party can read your body language and see you nodding in agreement before you say, "Right, right!" in assent. Absent those non-verbal cues, saying, "Right, right!" at the end of the other person's sentence can seem like you are trying to rush them along. The other people on the line don't have the luxury of reading your face, posture, and all that other good stuff. And you might come off as an impatient jerk. Which I hope I don't. But I could see where I might. So, I'm making a note to my self: CHILL. THE. F*CK. OUT. I wrote last week about oDesk (a tool that lets contractees check in on their contractors during their billable hours to make sure they're doing billable work). Now I'd like to share with you from IT Business Edge, this blog post that explains oDesk and some other monitoring tools that the more suspicious amongst us might want to use. Interesting...I wonder about using these for all computer-based employees, really. People can be running eBay side businesses from their cubes just like the shut-in might be. Or at least Sandia Peak has been conquered. Cancer may take a few more years, but thanks to your support, Stella is proud to say that we've done a little bit to fund cancer research and patient education. THANK YOU! More details: it was definitely a long walk. It turns out that six and a half miles straight uphill moving from 9,000 to 11,000 feet is the kind of thing your body notices. Most especially your feet will let you know that you've done something a little out of the ordinary. But no matter, it was a beautiful day, and walking through the Cibola National Forest was a treat. I've seen some really cool telepresence stuff profiled on various sites (and some kind of goofy stuff, too). But the fact is that most people don't need a high-end rig for the day-to-day videoconferencing that is the bread and butter of most telecommuters. This article from ComputerWorld has some great tips for getting started with videoconferencing without going nuts with the hardware. Having personally done most of the things the article notes (including tearing through a variety of IM clients that support video, headsets galore, firewall tweaks, and router mayhem), I can attest to the veracity of the tips in the piece. Don't get me wrong: high-end telepresence definitely has its place. I think for far-flung job interviews and high impact communications, you want as many pixels as you can throw at a screen. I just have found that in my regular workday, people mostly want to be assured that I have clothes on and that I seem to be paying attention to them. And I'm not sitting on a beach somewhere and I just forgot to tell them about my relocation to the Bahamas. It is so rare that you have a good customer service experience, particularly in the era of hosted services where everything is in the cloud somewhere. But Stella feels compelled to tell you about a great experience I just had with GoToMeeting and the nice folks at Citrix. Last month, I had a scheduled training session using GoToMeeting. There were a number of people signed up, I was rolling out a new service and I really wanted to make a good impression. People were able to connect to my meeting online, but the phone bridge was unavailable. Dead. Busy signal. So we had to cancel the training. Worse yet, for many of the folks in the session this was their first chance to interact with me virtually and it came off as flaky and unworkable. I called GoToMeeting customer support and discovered that they knew about the switch problem, but hadn't notified people who had meetings scheduled. To which I replied, "Seriously? You couldn't send an email? You couldn't put a notice about network availability in my GoToMeeting login area? Really?" I was a little flabbergasted, and so I sent them a feedback email to express my incredulity. Yesterday, I got a nice, written by a person (or a very eloquent robot) email response apologizing for the outage and the poor notification, noting that they're looking at ways to prevent the problem and let users know about problems sooner, and they credited my whole month's subscription fee. Here I was thinking about switching over to Microsoft's MeetMeNow. No way. I'm sticking with GoToMeeting! Finally, some useful advice about telecommuting: this heads up from the Cali and Jody blog has some really funny tips for successful telecommuting. I particularly like the suggestion to surveil the office to gather fodder for gossip about how people are dressed inappropriately. I've been trying to get my boss to turn his webcam out toward the parking lot for this very purpose. My tip for telecommuting success: start a home office happy hour tradition, wherein you stop working on a Friday afternoon at three and drink at home alone. You should pick up your kitten when he wants to run around, thus recreating the unwanted touching atmosphere that colors so many happy hours. In the latest edition of Stella video: a tour of headsets past and present. Would you like to buy the Logitech Clearchat Wireless? Try here. If you're an employer who is interested in starting a telecommuting program, it can be hard to know where to start. You don't want to just close up shop, send folks home and hope for the best. That could result in confusion and despair at best, and going out of business at worst. But having said that, you can get started with flexible work arrangements without too much hassle. 1. Identify job types best suited to telecommuting. 2. Select the best candidates for a telecommuting program. 3. Look into state and federal incentives. 4. Establish a trial period. 6. Track the results of the program. 7. Set goals for expanding the program. Seven steps to enlightenment! What could be easier? Those state and federal incentives are a good point: You may be able to offset some of your initial investment in technology and tools to support telecommuting by using tax rebates available through Small Business Administration and Environmental Protection Agency programs that exist. Reading this article also makes me realize that I need to help my manager and the whole organization do a better job quantifying the telecommuting that is going on there. There are now a total of three remote workers, and I'd like to organize us a bit so that we can prove that we're not only working, we're thriving. Assuming, of course, we are thriving. But that's why we have to do a little measuring. This is an interesting article about a site called oDesk that not only serves as a broker for freelance jobs, but also lets the contractor monitor the contractee at will. Honestly, I don't know what I think about it. I'm not a freelancer, and I try really hard to stay on the ball when I'm on the clock. I look at CNN or what have you probably as much as the next guy who is working in a cube somewhere, and I kick out the jams. But I'm not sure how I would enjoy having someone able to look in on my screen whenever and wherever they liked. People are generally wigging out about fuel costs, and I hear they are actually quite high. I haven't filled up my car since July 3, what with the living as a shut-in and all, so I wouldn't know about all that. But I do know that people are taking steps to reduce their car use. Like telecommuting as much as humanly possible. Telecommuting in the Phoenix metro has reached record levels according to this article. Plus people are riding the bus, biking, compressing their work weeks and so on. Fabulous! Keep up the good work, folks, no matter where you're doing it! It's not time to get ill. I don't think so, anyway. But then again I'm not precisely sure what time it really is where I am. I believe that I am on central time here at the conference I'm attending. My watch has mountain time. My laptop and Blackberry are on Real Office time (e.g. EDT). But then people are playing badminton and beach volleyball at 8 pm at night somewhere in the world. I'm a little distemporic. It's like dyspeptic without the upset stomach. Virtually none of their customers are actually located in physical proximity to any of their central Real Offices. So if you're doing all your customer management by phone and online meeting tools, you can do that from wherever, not necessarily by slogging to a cube somewhere. They're a technology company -- the product is all about being online, so why not the employees? They are secure (they tell me). In fact all the employees were complaining about how restrictive their on-network activity is. All of which is great! Rock on! Yes, Stella is by and large a "use common sense and it will all come out in the wash" kinda gal when it comes to the gory technical details of the Fair Labor Standards Act and Workers Compensation and all. This stems largely from my absolute naivete on these issues, frankly. It seems like many telecommuting programs also tend to have a don't ask-don't tell policy in this area. I've written before about cases where terrible things happen to people who work at home and the hazy area that can arise because the home office is somewhere between work and not-work. And really I don't have any more answers, except to say that it's something that people should be aware of, and consider addressing in their telecommuting policy documents. This article from the Free Lance-Star (a hysterical name for a paper with an article about telecommuting, if you ask me) raises the same issues. I just have to say this about the opening ceremony of the Beijing Olympics: wow. I cannot imagine how you get people to perform like this -- so many people, so precise. Holy cow. New York City is definitely a place that can benefit from telecommuting. Honestly, who wants to drive or be driven anywhere? And luxury apartment buildings are recognizing that a lot of people are working from home -- but when your home is 700 square feet, your home office can start to dominate the space. Enter the building-based coworking space. I have to say: what a great idea! The little girl had a birthday, and we rashly decided that books, clothing, and toys weren't quite enough and that what we really needed was another animal to pee on the floor. Welcome new boy-cat. 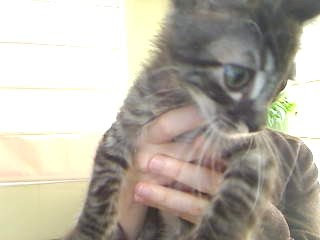 He is tentatively named Nombre (yes, there is a movement afoot to name the cat "Name"). It's kind of funny though, in a lolcats way...NOMbre...get it? And it's kind of like Hombre (which he is). I'm pleased to report that he's an excellent purrer, typist, and hisser-at-dogs. I'm looking forward to going to a conference where the dress code is "business casual" because I have some fierce stuff I want to wear. Like shoes. I become easily startled. My home office is so quiet and contemplative that when the phone rings I jump out of my skin. My standards for socialization are really low. I've reached a point where picking a machine right next to someone else at the gym is pretty close. I feel highly socialized when I have two telephone meetings and receive a bunch of email. I'm not sure if it's sad or good, but it is what it is. Laurie from Punk Rock HR is getting speaking consultation from a trained professional who has informed her that she's telling too much with her face. Punk, I feel your pain. I have a total inability to not make the "Are you kidding me" face when people say things to me that I think are dumb. It's a problem that telecommuters may notice more acutely at times than traditional Real Office workers. Like when they forget their webcams are broadcasting during an online meeting and they reflexively roll their eyes at some dumb thing some nice colleague says. In an actual meeting, the chances that every person in a meeting is looking at you when you widen your eyes in mock horror at some statement that the boss makes is slim. But when you're the only one on camera, people tend to notice these things more. Note to self: Look into full-face Botox. Perhaps a general paralytic will take my facial expressions from the "squirrel-eyes" level down to the "normal" range. "The bill instructed SBA to initiate a telecommuting pilot program to provide information regarding telecommuting to employers that are small business concerns and to encourage such employers to offer telecommuting options to employees. Which regions have been selected, and what was this selection based upon? What steps have been taken thus far to implement the telecommuting program? Have their thus far been any success stories?" Hey, that's the kind of thing I'm interested in too. So what's the good word from SBA? Stella will let you know. This article from Forbes is mind-bogglingly dumb, and also woefully lacking in those pesky little things...what are they again...uh...facts. I like that the one stat is "Commuting only accounts for 20% of weekly driving." So, wouldn't eliminating 20% of your weekly driving reduce your driving-based impact on the environment by like, 20%? The study the author cited is of a single company's telecommuting program in the 1990s. I think that one could make a case for measuring the total impact that a telecommuter's worklife has on the environment -- I recognize that even though I fill up my gas tank less than once a month I am probably undoing all that good by jetting about the country to take my show on-site every four to six weeks. But the folks who are driving to the Real Office every day also jet off to conferences on a regular basis and do other kinds of business related travel, so it might be a wash. I don't know. But I do know better than to put my perception that I'm doing better by the environment forward as a fact. Security is important for Real Office and shut in employees alike. When you're in the Real Office, a lot of the security stuff is taken care of for you -- you've got the big shredding bins, someone locks the joint up, and you're probably putting things on the networked drive as part of the normal way you work. When you're a shut in, you have to take responsibility for all that jazz yourself, to a large degree. This article from PC World has some good advice about steps to take, and gives some interesting data to chew on.